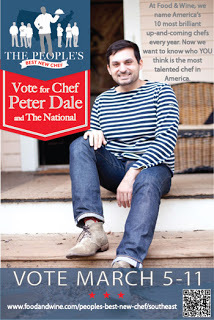 Vote for The National's Peter Dale for Food & Wine's People's Chef Award! Vote for The National&apos;s Peter Dale for Food & Wine&apos;s People&apos;s Chef Award! "I admire and respect so many of the nominees for&nbsp;Food &amp; Wine&apos;s The People&apos;s Best New Chef. It&apos;s truly an honor to be in their company. &nbsp;It&apos;s really exciting for the Athens culinary scene to get this national attention, so much is happening here," says Dale. Why He’s Amazing: Because his take on beautiful, Spanish-inspired Southern food is drawing crowds in a small college town. Favorite Knife: Dale prefers the Japanese brand Masahiro, for their super-sharp blades. Peter Dale graduated from the University of Georgia in 1999 with an A.B.J. degree in public relations, and soon after decided to pursue his interest in cooking. His mother is from Ecuador and his father is a former New Yorker of Greek descent; their backgrounds provided him with the opportunity to try many types of foods and his childhood was filled with travel. Peter has also been active in the opening of Empire State South, Hugh Acheson’s new Southern farm-to-table restaurant in Atlanta.